Hi everyone! 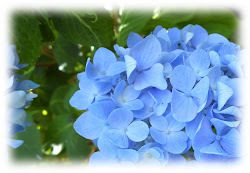 I have a new post at my other blog, bleu hydrangea. It's called "Transformation of a Garden and a Self." While showing pictures of my garden, I have a story to share with you. I'll be back in a couple of days here, with a new Play Date Cafe card. See you then! Merry Christmas! 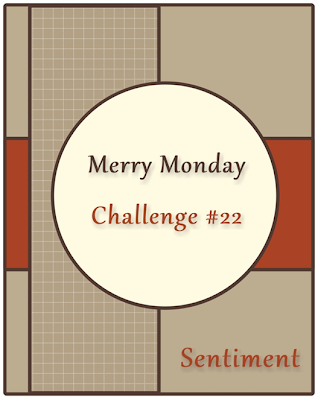 I know what month it really is, but I've been in a holiday mood while crafting my cards as Featured Designer for the Merry Monday challenges in May. This is the final May sketch, and I can't wait to show you what I made! I admit that, at first, I had trouble with this sketch. 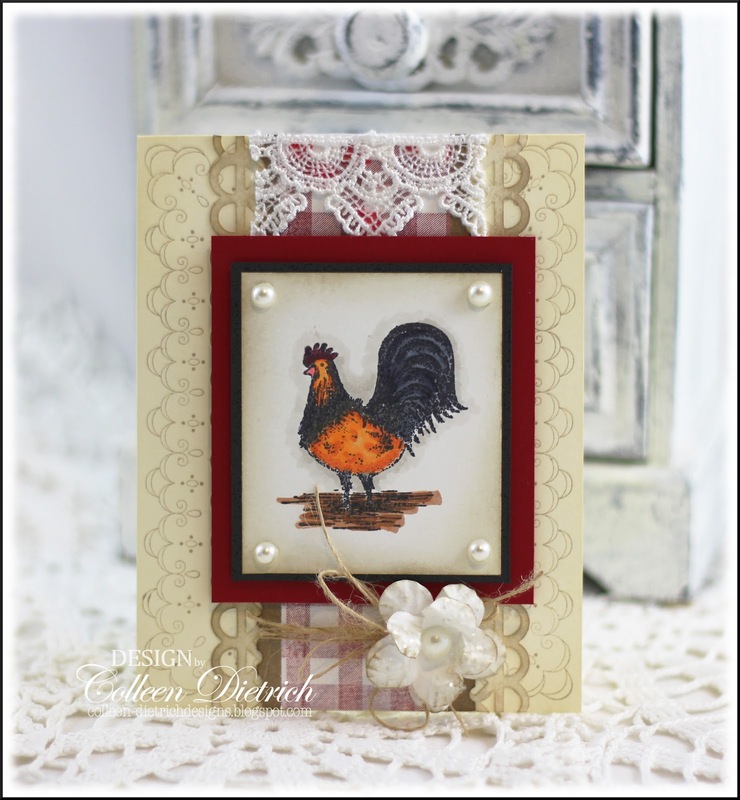 I made two other cards, using patterned paper scraps, and my critic 13 YO told me "No way." I guess she was right, because after looking at them, they just didn't seem 'blogworthy'. Then this winter white confection happened out of nowhere. I already had a glittered snowflake and a glittered cereal box-chipboard star on hand, so putting this centerpiece together was fast and easy. 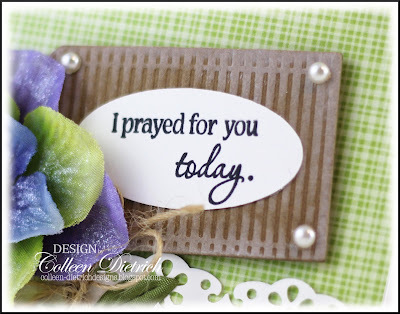 The doily die cut is from Martha Stewart. 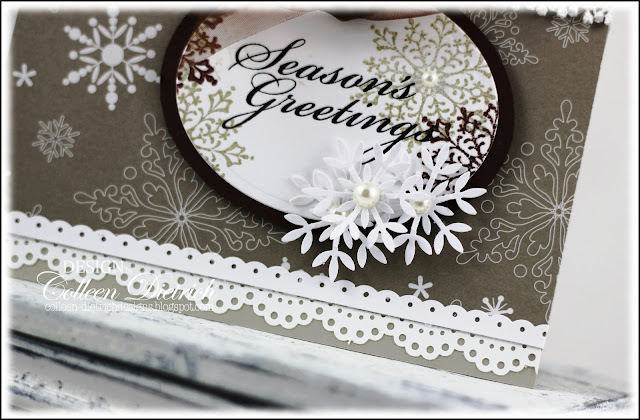 The cream snowflake patterned paper behind it is part of a Hallmark Christmas card that I snuck into my crafting drawers, knowing it would find a good home someday. And the lace is from, of all places, Walmart. Yup. 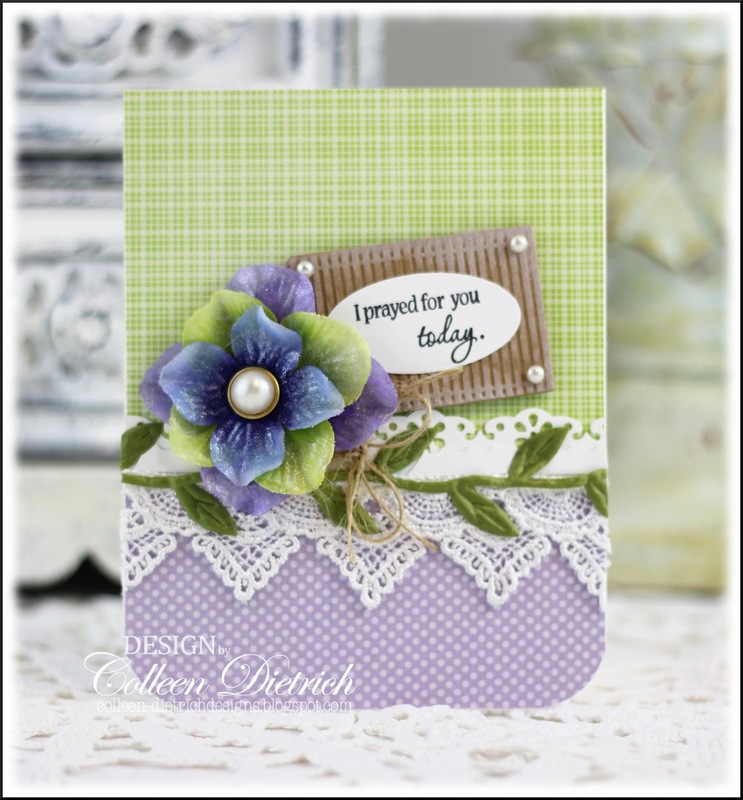 A big thanks to Lesley Croghan for asking me to be the May Guest Designer at the Merry Monday Challenge! 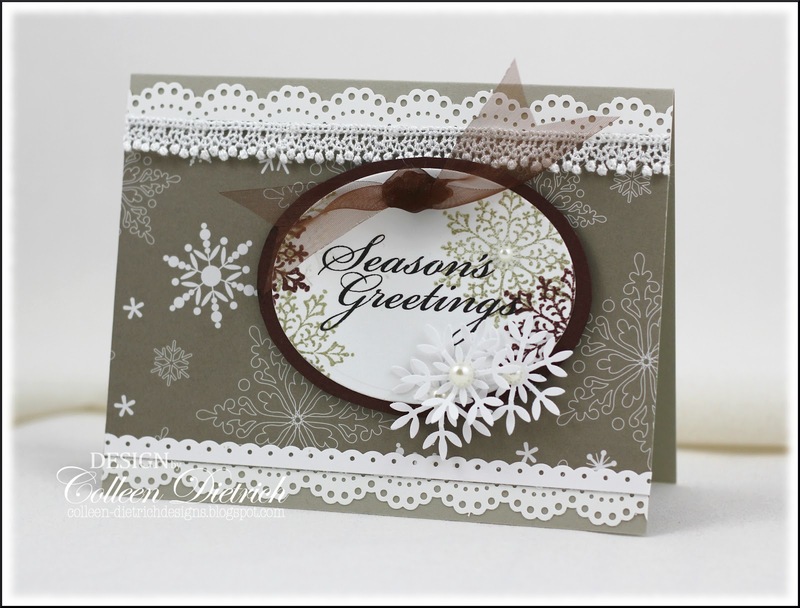 I had so much fun creating Christmas cards for your challenge, and you are a complete pleasure to work with. :-) You're the best, Lesley! Hello everyone! 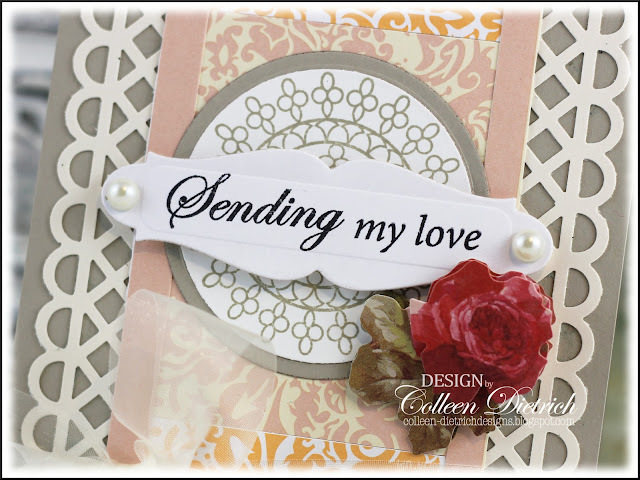 A special 'hello' goes out to the folks who recently subscribed by email, or became a Follower on the sidebar. It makes me happy that you like my stuff enough to subscribe. :-) Thank you! 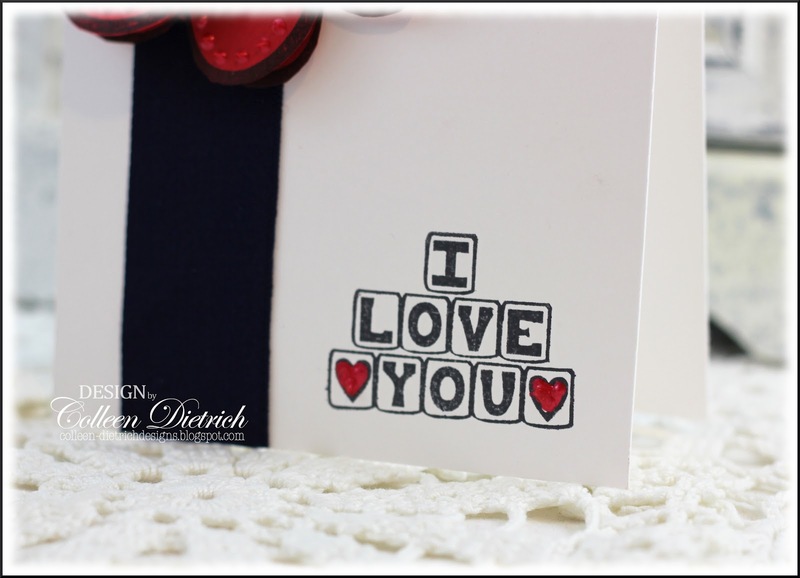 This post is a little wordy, so if you want to skip down to the card, I don't mind at all! In the Winter 2012 issue of a magazine called 'Artful Blogging' a blogger named Lynda Naranjo (lynda-naranjo.blogspot.com) said some things that rang true for me. I'm sharing an excerpt here. "Keeping a blog takes planning, work, and commitment. There are weeks when my life gets busier than I had planned and sometimes my blog gets pushed to the back burner. When that happens, I feel disconnected, as if a part of myself has gone missing. 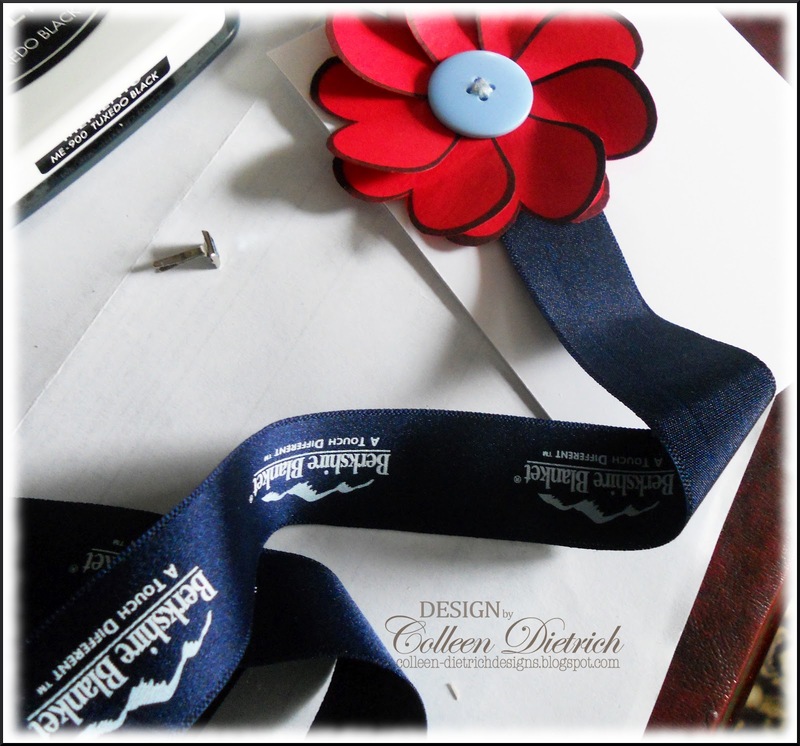 "Planning my posts in advance is much easier than just flying by the seat of my pants. Using the scheduling tools that Blogger provides has been very helpful to me in planning my future posts. ...But it doesn't end with uploading a post to my blog. Visiting other bloggers who take the time to read and comment on my blog is just as important as updating regularly, if not more so. 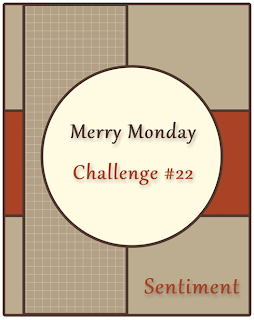 Every week I try to set aside time to visit other blogs. This is where friendships develop and connections are made. 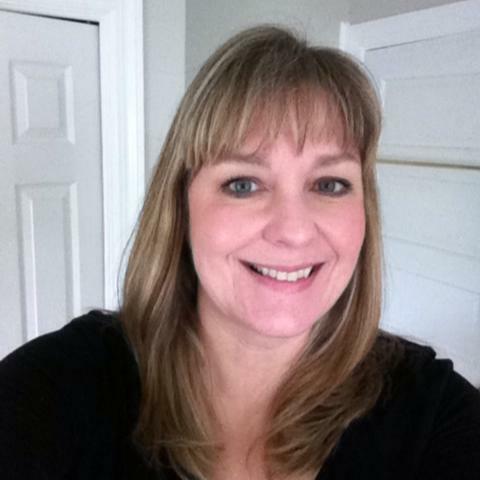 "During a particularly busy period in my life...I realized how much I needed to blog. Blogging is my social network -- the place where I connect with other creative souls to inspire and be inspired. Bloggers are like my co-workers; reading someone else's blog is similar to having a chat in the coffee room or dashing out for a quick lunch." It's as if Ms. Naranjo was reading my mind. I have had SUCH a busy month or so in my personal life, and my blog has taken kind of a back seat (even though it may not seem that way to some). I'm thankful for the Advanced Scheduling that Blogger allows me to do. :-) Even though I am able to get some posts of my own up, I haven't had as much time to visit other blogs, and I miss it. This busy period is temporary; soon, I'll be back to visiting you all, as I so enjoy. Annnnd on to my card now! This is for a friend who is going through a rough time, and I'm hoping it will cheer her up. This is a 'custom' bloom, assembled from little petals I picked up from the floor of a craft store (I was only helping them clean up, you know). I used a pearl brad, and some shimmer paint from Creative Inspirations Paints: 'Fairy Dust' doesn't give color, just glorious iridescence. You can use it on almost anything! LOVE the stuff. 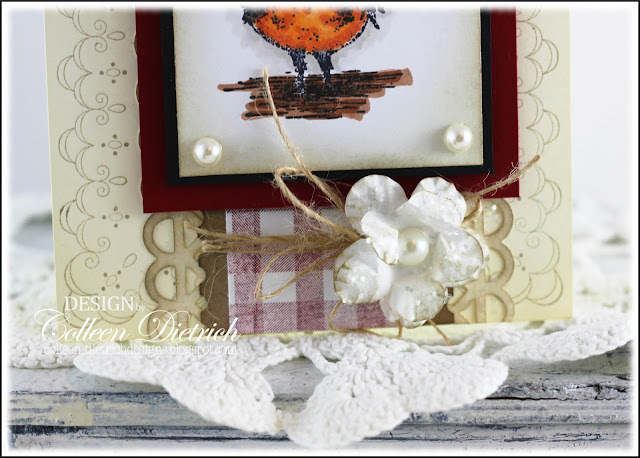 This little tag is from a $1.50 bag of chipboard from Michael's, and I wiped Whisper White craft ink over it. My friend Tammy inspired me to do this. (thank you, Tammy!) 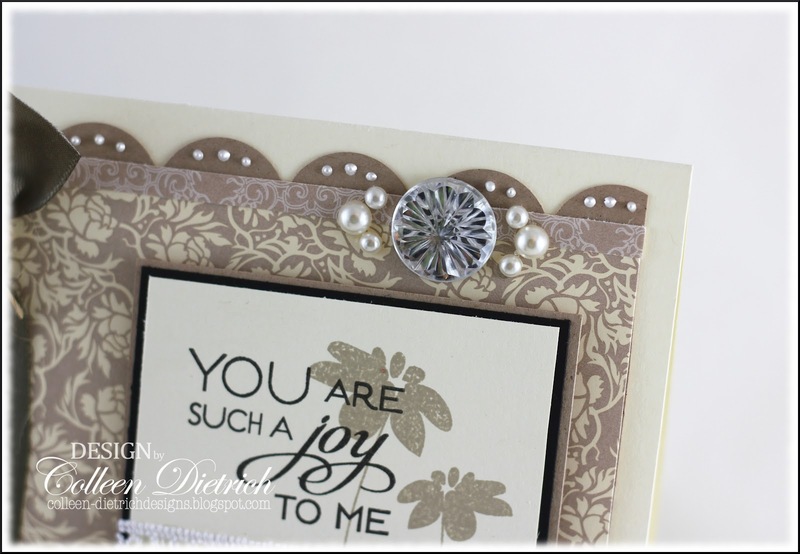 A Verve sentiment on a white oval punch and some pearls finish it off. I'll see you tomorrow with my last card as May's Featured Artist at the Merry Monday challenge. Thank you ever so much for hanging with me for this long post! 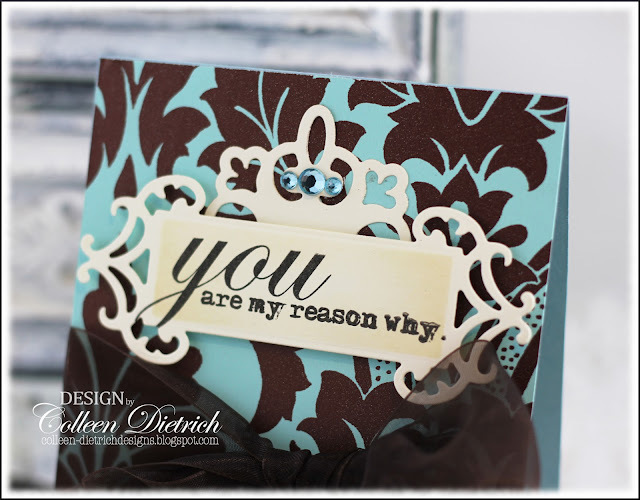 I am super excited to share my announcement with you all today: I am joining the design team at Inspired by Stamping! Owner Joanna Munster has created stamps that make my heart swoon. Please do visit her shop HERE to see what I mean. Her selection of flowers makes me all giddy (sigh). 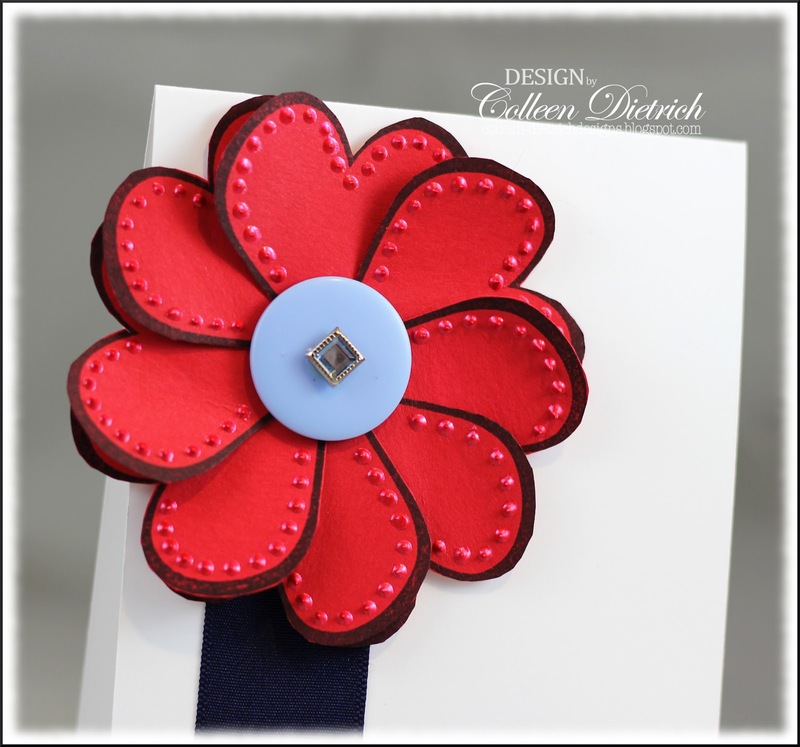 My design team goodies are en route to me from Down Under as we speak, and I cannot WAIT to play with them! Just wait until you see the June release (that's where I come in) - oh! 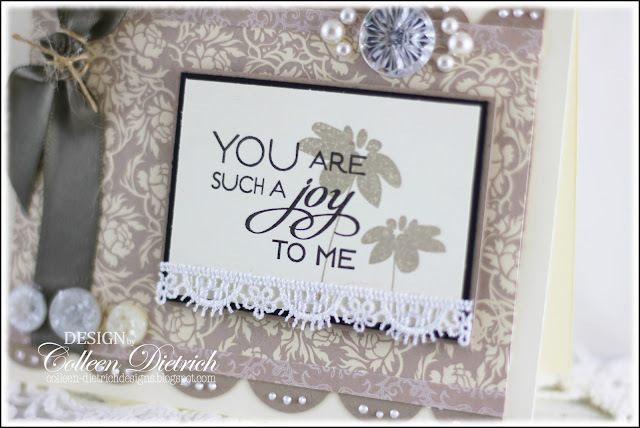 The design team really rocks -- such a nice group of highly talented crafters -- and you can check them out HERE. I am honored to be joining them! Thank you, Joanna, for this lovely opportunity. challenge card, where I am a Featured Artist. Baby Blue, Cherry and Denim are the new colors this week at The Play Date Cafe. 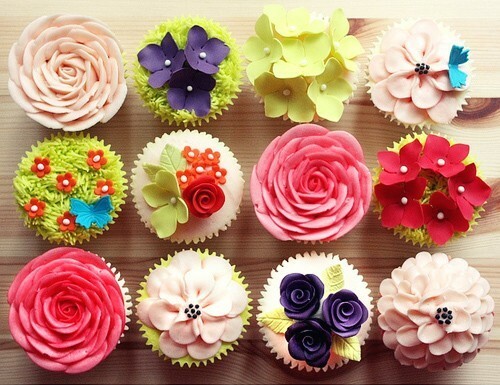 Don't they look so summery? 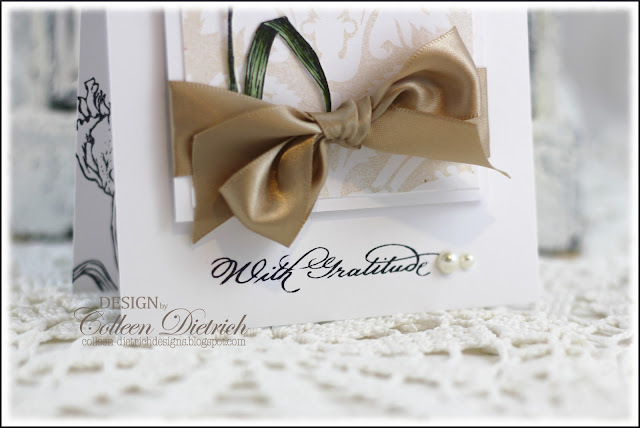 We have a great, unique sponsor too: Mr. Cricut Crazy! 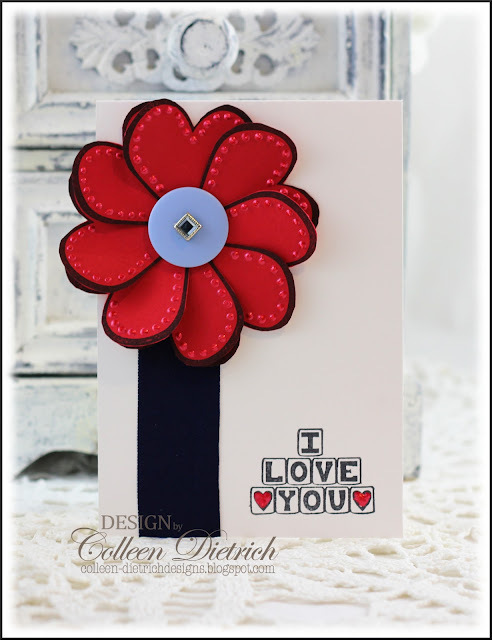 I stamped it 8 times on red cardstock, trimmed each one, then assembled them with Scor-Tape on a circle die cut from red cardstock also. With my fingers, I gently lifted each 'petal', then used Liquid Pearls to dress them up. 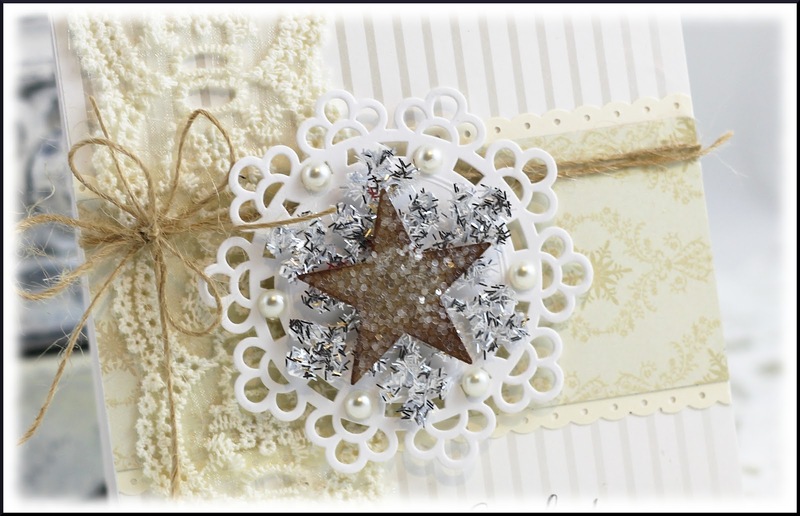 The center is a button from Jolee's Boutique, topped with a rhinestone brad. The ribbon 'stem' came off blanket packaging for one of our beds. It has printing on the reverse, but so what? 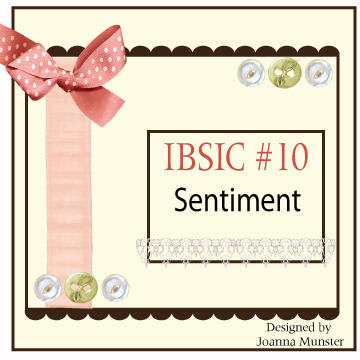 Here's the block sentiment, with a bit of Liquid Pearls on each heart. Hope you get a chance to play along with us, and don't forget to check out the design team's creations HERE. Mr. Cricut Crazy's Design Team is also playing along, so that's double the inspiration for YOU! Thanks for joining me and have a beautiful day! I used some new-to-me Verve stamps called Kind Words (both the flowers and the sentiment). The lace is from JoAnns. The buttons along the bottom are from my stash, and I coated them with clear glitter. I really hope you can join us at the challenge! You do NOT have to use Inspired by Stamping's line of stamps or flowers to play. 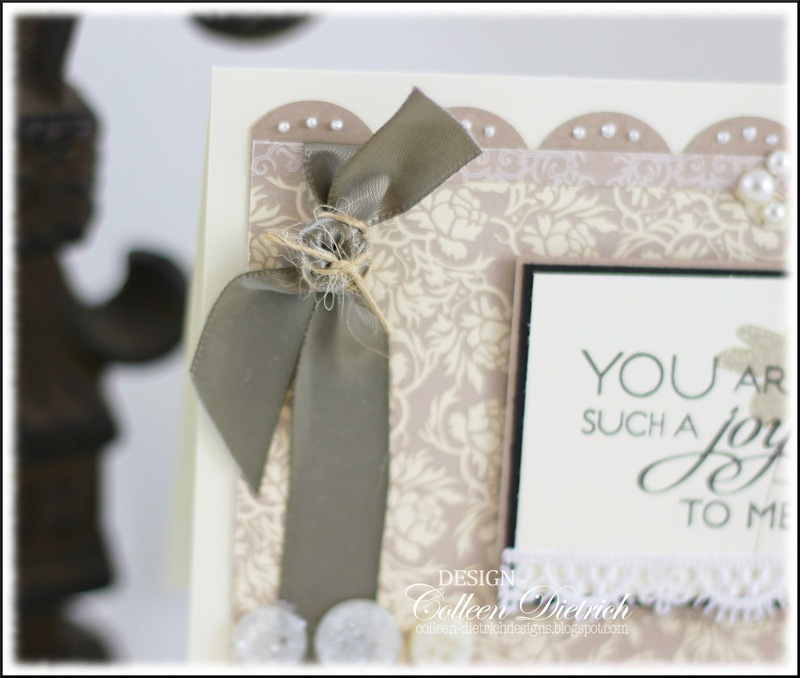 You can find all the details and link up your creation HERE. 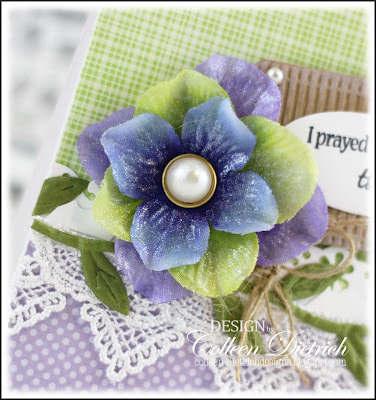 On a personal note, I want to enter my card at Moxie Fab World's Damask/Brocade challenge, and at Flourishes Timeless Tuesday challenge - to include a flower. I noticed that I reached over 200 Followers on my sidebar. 200!! I am so excited! Thank you! When my crazy-hectic schedule slows down a bit more in the coming weeks, I'll offer up some blog candy to show my appreciation. Hi there! 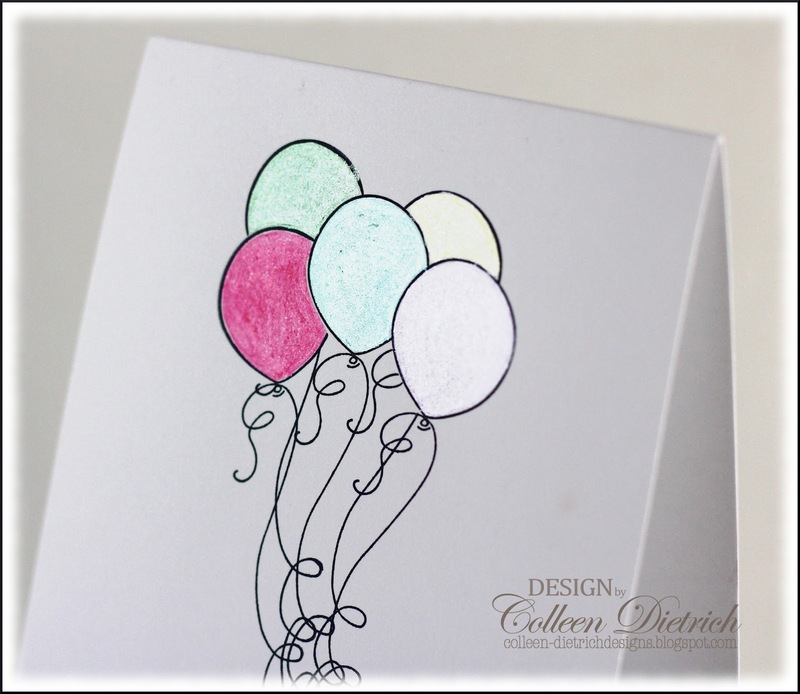 This week, Creative Inspirations Paints has a challenge about "Balloons." 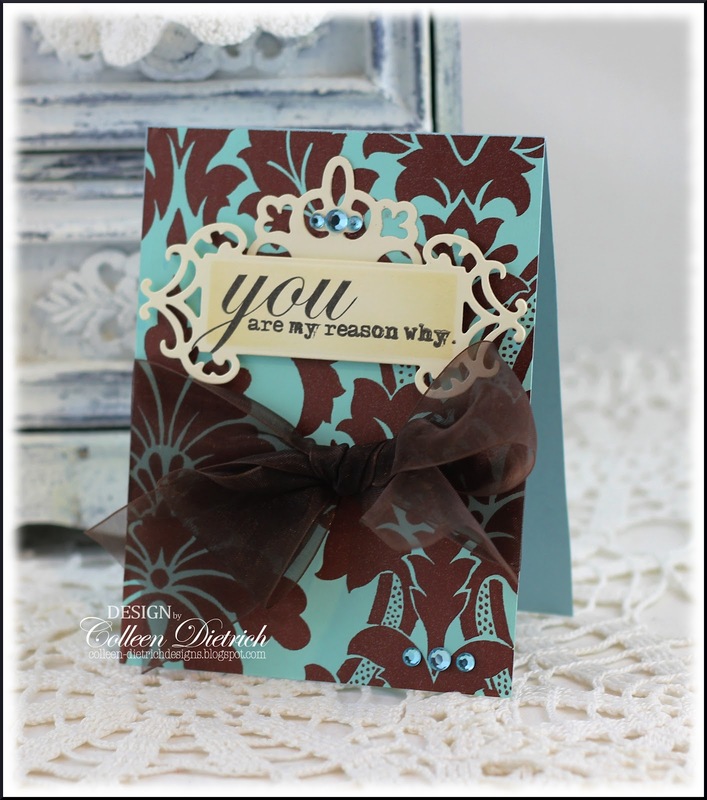 I pulled out a Stampin' Up! set that I have barely used, Crazy for Cupcakes, and found a balloon there. I used the masking technique to create my bouquet, and when I was finished with the masks, I stuck them to the inside of the stamp case, for another time. The curlicue border and sentiments are SRM stickers that I won recently. This is the first time I've ever used SRM. I love the stuff! Hope you get a chance to play with us! Some info-to-know from Creative Inspirations Paints blog: Each week you will be given a challenge to find inspiration in/from what ever the challenge theme is... you can be as literal or abstract in your inspiration as you want....Just make sure you can tie it back to the theme! Challenge closes at 6:00pm Eastern on Saturday. 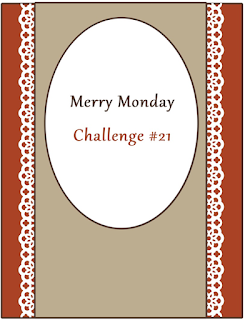 The rules can always be found by clicking the tab "Challenge Rules" at the top of the page. 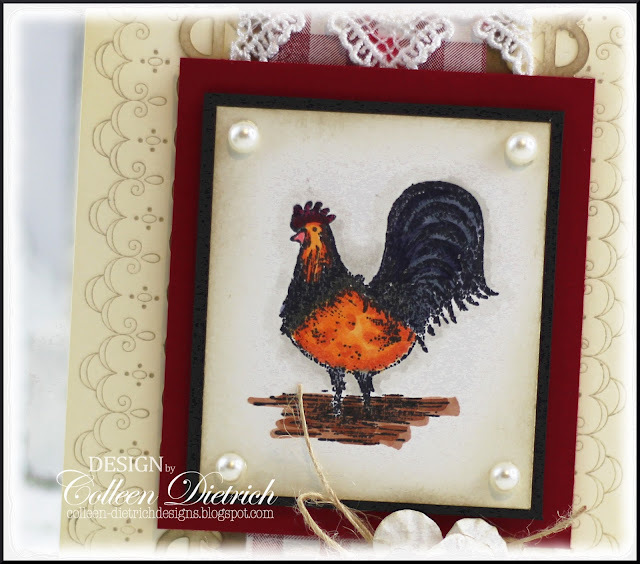 You do not need to use the Creative Inspirations Paints in your project, however, if you do, tell us which colors you used, and your name will go in the drawing twice! Each month, one person will win 5 jars of paint in the colors of their choice. The winner will be randomly drawn from all the people who have played that month, so make sure to join in on our challenges each week! Hello! I have two damask cards to share today, and both are being entered in Moxie Fab World's Damask & Brocade challenge. When I saw that challenge go up, I just melted. I ADORE damask patterns. Unfortunately, my schedule has been SO very busy lately that this is my first chance to enter the challenge. Today, I needed - not wanted, but needed - to make a card (or two), just because. Ever feel that way? Let's get to the cards. 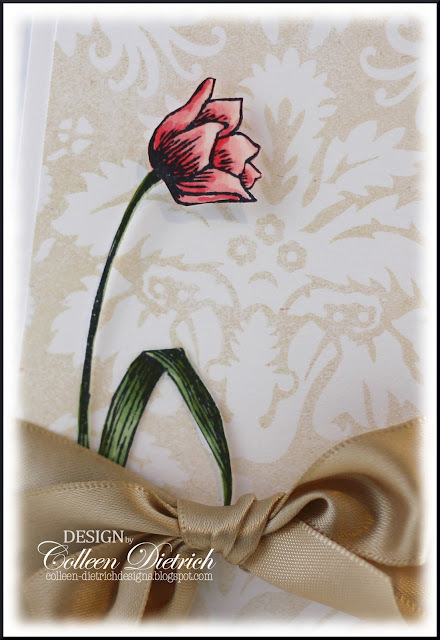 Other challenges entered with this card: A Blog Named Hero, the challenge: to dust 'em off (use stamps you haven't used in some time - mine is the Flourishes 'Thank You' set); and Flourishes Timeless Tuesday: use a flower. I do love this Flourishes tulip and have missed it! The Large Fabric Design stamp looks so pretty in Wheat Versamagic ink. I was lucky to find a scrap of satin ribbon in approximately the same hue. The next card uses some amazing gift wrap. 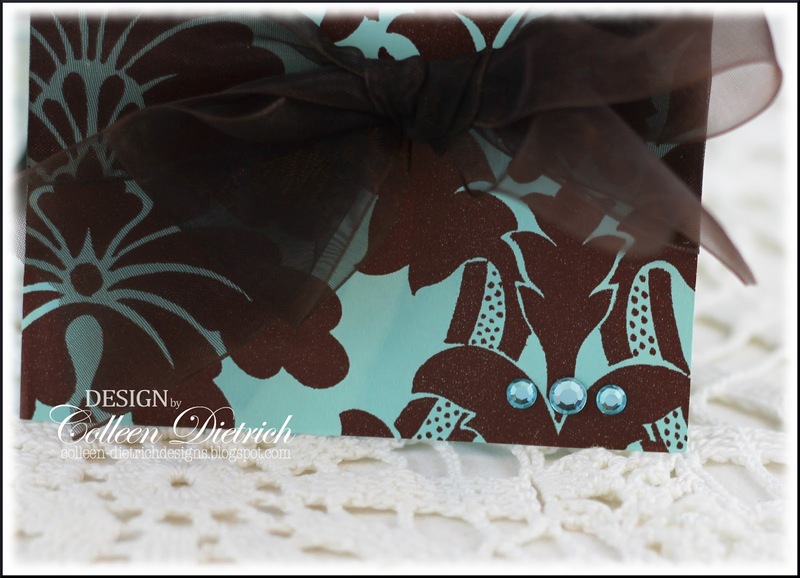 I LOVE the design and the chocolate-and-Tiffany blue combo. A touch of bling on the sentiment area and down in this corner are all the adornment it needed (beside the bow). Found out today that THIS card received an Honorable Mention at Papercraft Star. Thank you, Papercraft Star! 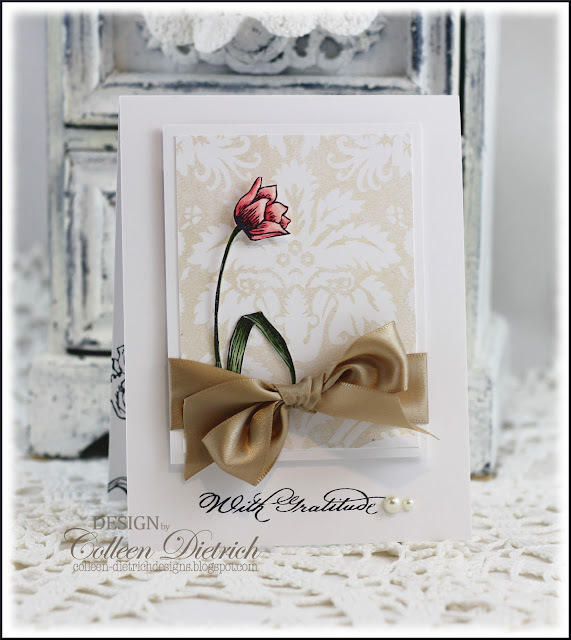 I'll be back tomorrow with a Creative Inspirations Paints card. 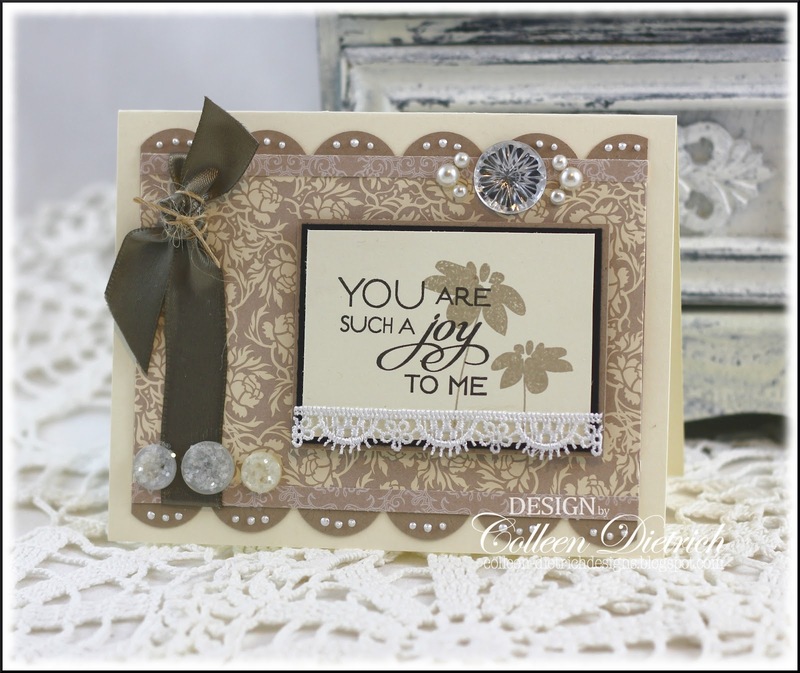 It's quite CAS....very different from these two cards! See you soon. Other: Copic markers; pearls - Queen & Co.